Posted December 24, 2013 by Marshall Sandoval. I’m terrible at waiting. When I was a kid, I could hardly wait to open Christmas presents. Also, last week I could hardly wait to open presents. In my eagerness, I’ll inspect a present top to bottom. I’ll shake it, prod it, drop it, measure it, and sometimes smell it in an attempt to determine what’s inside the wrapping paper. That’s the kind of person I am; I struggle with the tensions of waiting. In our personal journeys, we’re constantly placed in holding patterns. Whether we’re good at it or not, as Christians, we’re asked to do it. Spiritual discipline and growth do not happen quickly. To set out to grow and hope is to set out to wait. I want the quick fix of instant results so desperately. I want spiritual disciplines to result in change immediately, like a body builder weighing herself after a week of workouts. This is never promised to us and it’s rarely the narrative we see in the Bible. The Israelites had to wander the dessert for forty years before they reached the promised land. David cut a piece of Saul’s robe and waited for God’s timing instead of seizing the throne when it seemed to make pragmatic sense. What can seem more disheartening is that it rarely ends well for people like me when we jump the gun. King Uzziah didn’t want to wait for the appointed priests to give his offering to the Lord and for entering the Holy of Holies he was struck with leprosy. It’s not a bad image for the ways I try to short cut my faith all the time. I love the Magnificat and the Song of Simeon because they remind me that there’s a reason behind our waiting. Mary had to have been overwhelmed and stretched by the miraculous pregnancy, but God indeed, “looked down on the humble estate of his servant” and now all generations call Mary blessed. The beautiful words of the song seem to call back to the prophecies of Isaiah; they tell of what God, in his justice, has done. In the midst of the turmoil of the miraculous pregnancies she responds in gratitude for God’s faithfulness to her and to his people. Simeon too, waited years for the fulfillment of God’s promise. His beautiful song of praise was his spontaneous response upon finally seeing the Messiah in his lifetime. Christian tradition now venerates Simeon as the God-receiver. Before Jesus had performed a single miracle, the Lord fulfilled his promise revealing Jesus to him by the Holy Spirit. Simeon’s story and Mary’s story are written into the church’s story in the liturgies of Advent. Corporately as well as individually, we recognize the season of preparation and waiting during Advent. The celebration of Christmas, like the songs of Mary and Simeon, revels in God’s faithfulness. 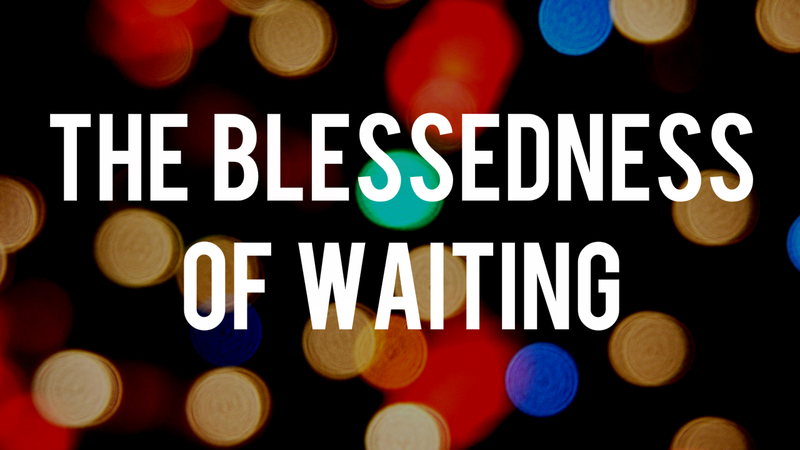 Seasons of waiting can be difficult and they’re deeply counter-cultural. Yet, time and time again God’s slow and spontaneous work in the world proves worth the wait.